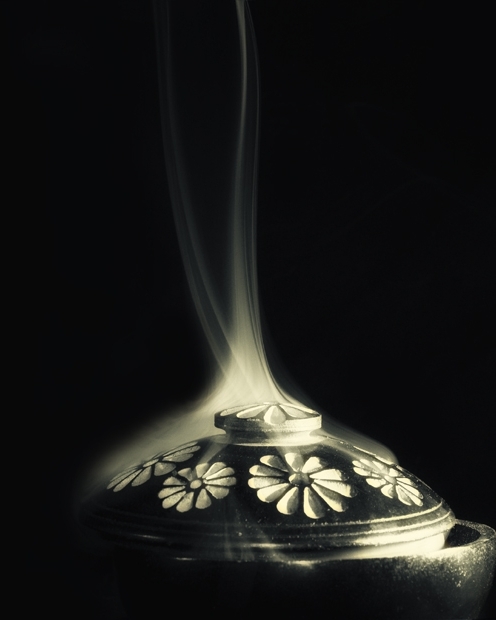 Since we have launched our series of chronicles by reviewing an incense perfume -which you can find here if you haven't read it- we deemed it fit to open our series of Overviews by –you might have guessed it by now : an incense. And not any incense for we are about to tell you the story of the King of Incenses, the Qetoret, YHWH’s very own incense of which five kilos were burnt everyday, at dusk and dawn, in the Temple of Jerusalem ere it was destroyed in the year 70 of our era. An incense so thick with perfume that one could smell it from Jericho. The reader might be tempted to doubt the pertinence of this article considering the recipe is so clearly stated. Well, this is where things start to get a little rough –for our greatest pleasure. The Bible, ever since its genesis, is the fruit of a marvelous synergy between oral and written traditions. Countless traditions, observed for centuries by countless priests and faithful, were added to the Scripture, which ended up being compiled in the way we now know. This Tradition, this living orality, teaches us that to the four ingredients we mentioned, seven more were added totalling in an amount of eleven different materials. Even though we would love to delve into the symbolic meaning of this number, it is not the subject of this article – we might consider writing such article, should the reader ask for it. Considering the only family who was charged with crafting the Qetoret has gone with its secrets, it is now rather difficult to know the exact ingredients composing the incense. Ever since the destruction of the Second Temple, generations of rabbis and philosophers have extensively written about this very subject without ever coming to a consensus. The purpose of this article is thus to synthetise our own years of research and readings and to share with you all, what we think is the authentic recipe of the Qetoret. The first ingredient mentioned here is the Balsam, sometimes referred to as stacte. The Bible uses the word « nataf » conveying the basic idea of a resin dripping from any tree, whereas the tradition calls it balsam or « tsori ». Far from our Peru or Tolu balsams, Maimonides thinks the resin in question is in fact the balsam of Gilead or Mecca balsam, impossible to find today. On the opposite, Rabbi ben Gamliel believes the balsam referred to styrax. However, following the use of the word « stacte » we think the resin in question might actually be…stacte. By stacte, Greeks meant the few drops of liquid myrrh that sometimes form in a bigger bubble and exhale the sweetest odour. Balsam or tsori symbolically represents the Torah, which is like a soothing balm for the soul but also God’s enveloping love towards His children. The second ingredient is as controversial, if not more. Onycha’s the name. There are two main theories as to what it could have been. The first one thinks onycha referred to the operculum of a certain mollusk one could find in the Red Sea and which shape resembles that of a lion’s nail – according to Abraham de Porta Leone. This theory however is contested by some researchers for whom it is impossible that the shell of a mollusk –thus non-kosher- would have been used in the making of the most sacred of incenses. Let’s just say here that, according to Maimonides, ambergris –non kosher too- also came into the composition of Qetoret. They think that onycha meant labdanum, which would make sense considering the Hebrew word « shecheleth » - close to shehor which means black- was translated in Greek by onycha – and we can easily draw a parallel between onycha and onyx, a black gemstone. The root of shecheleth meaning « to drop » or « to distill », it would seem that shecheleth refers to an exsudation. Nonetheless, we still believe that onycha refers to the operculum since the recipe for Qetoret calls for Karshina soap, Cypriot –or capers- wine and Sodom salts, which only purpose is to purify the shell of its impurities –which would have been obsolete if it were labdanum. 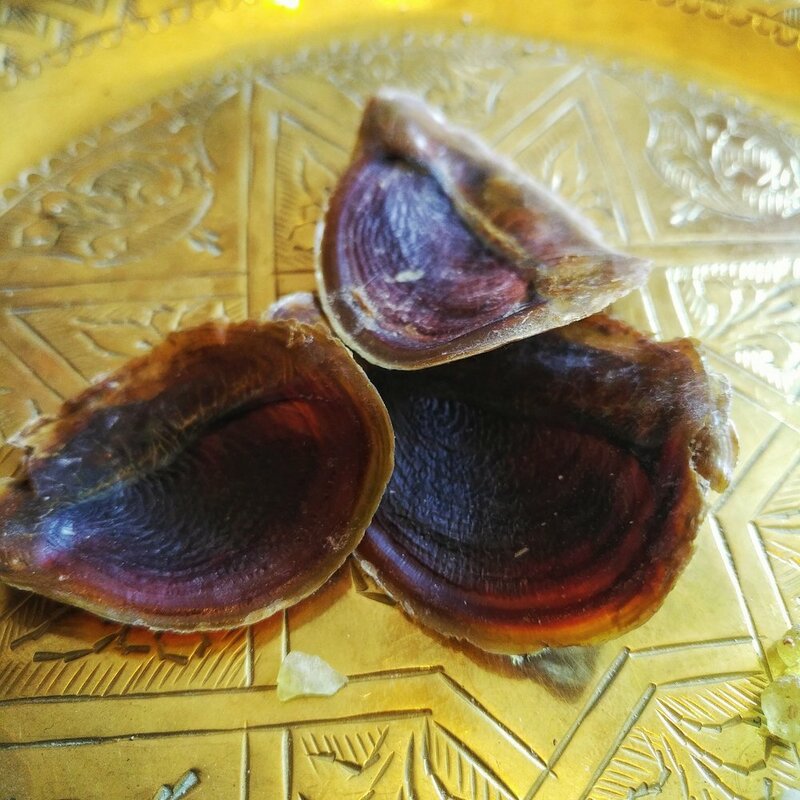 Moreover, during our many trips to Middle Eastern souqs, we came across such shells traditionnally used to make bakhoor, verifying a long established tradition. Finally, it is interesting to note that the onycha would represent the majority of the Hebrew people -pure and holy on the inside, but sullied on the outside- that needed be cleansed through repentance –the Karshina lye- and fortified by the secret arcanes of the Torah –the wine- so it would be firm in its belief. This esoteric meaning of onycha clearly tells us that it didn’t refer to labdanum. The third ingredient is galbanum. Everyone agrees that it is indeed the galbanum we all know, which sole purpose was to emit a foul smell whilst burning, thus representing the sinners amongst the Hebrew, whose prayer was associated with that of the immaculate ones. Aryeh Kaplan, drawing a parallel between the cosmic and esoteric dimensions of the Torah, emitted the idea that galbanum in fact symbolised the transmutation of evil into good through its elevation –or return to its original, forgotten source. This can easily be linked with repentance and the idea of an incense sacrifice, supposed to « lift » a curse. The fourth ingredient is frankincense. Frankincense reminded the faithful of God’s love towards His children, by which He cleansed them of all their sins. We’re now arriving to the most interesting part. The so-called « sweet spices », namely : myrrh, cassia, nard, saffron, costus, aromatic bark and cinnamon. About myrrh, if some think that it refers to any resin of commiphora trees, Maimonides –him again- thinks, rather surprisingly, that it meant…deer musk. We do agree with him all the more knowing that deer musk is an ingredient of the Holy Chrism of Constantinople, which recipe was partly derived from that of…Qetoret. Cassia…Though some scholars think that it refers to modern-day cassia, some, including Flavius Josephus, believe cassia was in fact orris root. Nard is the renown spikenard, the same that Maria of Magdalene used to anoint Christ’s feet. It is also interesting to see that the Greeks used the word « nard » while referring to a certain variety of lavander. Hence, should one of the readers want to order nard incense or nard oil from Greece, he wouldn’t receive a phial of nard jatamansi but probably lavender oil. Saffron and costus refer to both saffron and costus –simple enough. The aromatic bark, to us, refers to cinnamon bark whereas the cinnamon is not what it sounds like. Maimonides believes it is nothing else but « al oud ». Considering oud was used in Jewish, Nabatean and Yemeni burial rites, and also that it is one of the « foreign » ingredients of the Holy Chrism –along with ambergris and deer musk- we think he was right in his assumption. The recipe called at last for another herb, maaleh ashef, which was used only so that the smoke would rise in a straight column before the Ark. This herb was a secret most heavily guarded by the Avtinas and despite having no known records of what it might have been, some have speculated of late that it was a byproduct of the Leptadenia pyrotechnica tree. Burning Qetoret without adding in maaleh ashaf was punishable by death. Eleven ingredients to create a mystical incense, lifting up curses, transmuting evil into good, rising up as a praise to YHWH ; eleven ingredients symbolising the priceless prize, God’s knowledge –ten symbolising completude. Eleven ingredients, one of which foul smelling ; a foul smell that ends up rising as a perfume of absolute divinity when combined to the rest, teaching us about repentance – lest we repent, our prayer shall only rise as a foul smelling offering to God. Qetoret, by teaching the faithful repentance, teaches a lot about humility, about life. The priceless prize, God’s knowledge of Himself, could it be nothing else but utter humility ? Could it be the key to understanding the world ? Could it be the key to understand ourselves ?